Product prices and availability are accurate as of 2019-04-19 17:41:21 UTC and are subject to change. Any price and availability information displayed on http://www.amazon.com/ at the time of purchase will apply to the purchase of this product.
? FOUR SIZES & MULTIPLE COLORS TO CHOOSE, We listen to our customers and provide what you want.
? SUPER SOFT, it is different from most of the old style cooling towels that are crunchy hard when dry. Alfamo cooling towel is always soft both wet and dry.
? ABSORBENT AND BREATHABLE, the special mesh fabric retains enough water that is required for the cooling effect. And it is breathable comfortable to skin.
? REALLY COOL , the towel cools up to 30 degree below body temperature when wet and it lasts for up to 3 hours until the next rehydration if not under direct sun.
? HIGH QUALITY EDGE STITCHING, towel edge is improved to avoid any possible sloppy threads.
? 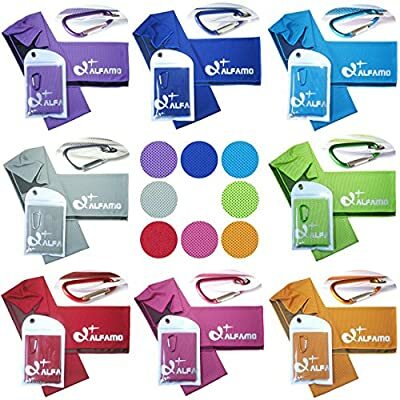 FIRST COOLING TOWEL WITH FLAT POUCH, The towel comes in water resistant plastic case, with D shape carabiner, easy for storage when you go climbing, cycling or hiking.
? ALSO GREAT FOR CELLPHONE STORAGE, Though the case is not 100% water proof, it is water resistant, good for mobile phones storage as well.